Recently, during the shoot of Sunny Deol’s directorial venture Pal Pal Dil Ke Paas, starring another Deol kid Karan as a debutant, was surprised by an unexpected visitor. 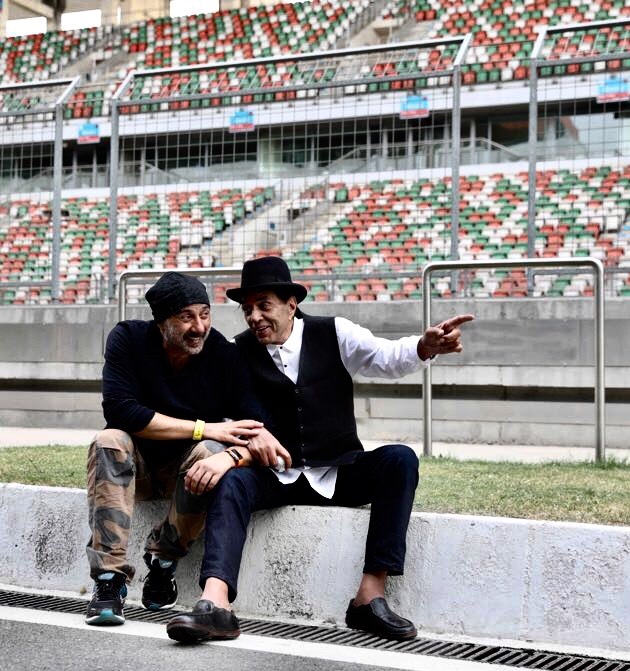 The team was shooting at the Buddh racing circuit in NCR, when Dharmendra arrived at the location and the moment turned intense and how! The Deol’s have always prioritized their family above everything else and the eldest son can’t agree to it anymore. Sunny, after his papa’s surprised arrival got him so emotional that everything appeared like a mirage to him. Amidst all of it, one of the most important scenes from the film was being shot, with high-end cars racing sequence, a technical crew from abroad and among the drivers is Gaurav Gill, the first Indian driver to win the FIA Asia-Pacific Rally Championship. Director confirmed it to be the most integral part of the script. Adding to his statement, Dharmendra said, “I’d dropped by the Betaab (Sunny’s first film) sets unannounced too and watched him playing football. My Kashmiri brothers and sister have since named that location as ‘Betaab Valley’ in a touching gesture of love. Over three decades later, I arrived to find Karan behind the wheel of a racing car and watched him on the monitor where he spotted me after the shot”. With movies like Dillagi, a love triangle featuring Sunny himself alongside younger brother Bobby and Urmila Matondkar, in 1999, Sunny Deol’s endeavor as a director has been a decent one. He returned 17 years later with Ghayal Once Again and is now all prepared to launch his son and Seher Bamba in his third directorial project. The team will travel to Manali for its next schedule and shall wrap up the film in Mumbai. 15 queries in 0.457 seconds.